Canopy tents are one of the most versatile pieces of outdoor gear, yet not as popular as they should be amongst campers and outdoor enthusiasts. Pop-up canopies can be found at almost any big box store but more often than not these flimsy shelters end up being a waste of money. They tend to be poor quality, can hardly stand up to wind and the fabric ends up brittle from sun exposure. More and truer outdoor brands provide the traditional canopy tent model, with the added durability and weather protection needed for the backcountry. Canopies aren’t just for outdoor festivals and backyard get-togethers. These structures are perfect for warm weather camping, group activities and for extended trips with a base camp situation. Sometimes a traditional tent just doesn’t cut it or you need additional shelter. If you find yourself in such a situation, you’ll want one of these 5 canopies in your gear cache. The North Face Homestead Shelter is bright, bold and perfect for as a basecamp for a weekend excursion. It has the traditional look of a canopy but has a few hidden features that really make it stand out. The Homestead Shelter is spacious, versatile and is priced reasonably for all the little details that TNF added. The Homestead Shelter is easy to pitch and take down, with only two people needed. It requires only 4 poles, all of which are very strong yet lightweight aluminum. Most users find that is handle winds very well, though if you know you’ll experience strong gusts it’s always a good idea to tie it down- that practice goes for essentially all canopies. With 87.5 sq ft of covered space, there is more than enough room for a few people to share. TNF purposely made this shelter the dimensions it is for two reasons. First off, it is just large enough to fit over standard picnic tables. Having a completely weatherproof area to sit, eat and talk is a lifesaver and far more preferable over everyone eating alone in their own tents. Secondly, the doors of the Homestead Shelter are large enough that you can fit a typical queen-size air mattress inside. If you’re camping out in clear, summer weather you can use this shelter in place of a tent. It also can come in handy as a group “hangout” spot or a place for kids to play. If you’re specifically looking for a canopy that you can use as a tent or sleeping shelter, look no further than Mountain Hardwear’s hoop Dreams 4. This unusual, almost circus-esque tent has solid walls, offering plenty of privacy and weather-protection. The Hoop Dreams 4 shelter is essentially a cross between a traditional tent and a normal canopy. It isn’t as tall or open as a canopy but isn’t as cramped or enclosed as a tent. The round shape of it is perfect for windy conditions and the sloping sides shed water easily. It is a surprisingly sturdy structure, using only two poles to hold it up. A useful but also intriguing design feature is the center pole. The Trussring pole helps to really open up the ceiling and also function as a makeshift clothesline. They are a total of 6 different guyline points for staking out the Hoop Dream 4. If you wish to have more space inside the tent, it is possible to not use the center pole and instead guy lined out. This work well if under a tree or other structure. You can also use a trekking pole in place of the center pole, if your main concern is weight or if you’re backpacking. This shelter comes with everything you need for the normal center pole setup as well as 9 stakes. Despite seeming like a complicated shelter, setting it up is just as easy and fast as any other tent or canopy. This Hoop Dream 4 is appropriate for 3 season use and has a sitting capacity of 4 adults. There is a single wide door entrance, which can be completely closed during bad weather. This shelter is a bit unusual but an excellent choice for a smaller, unique canopy tent. 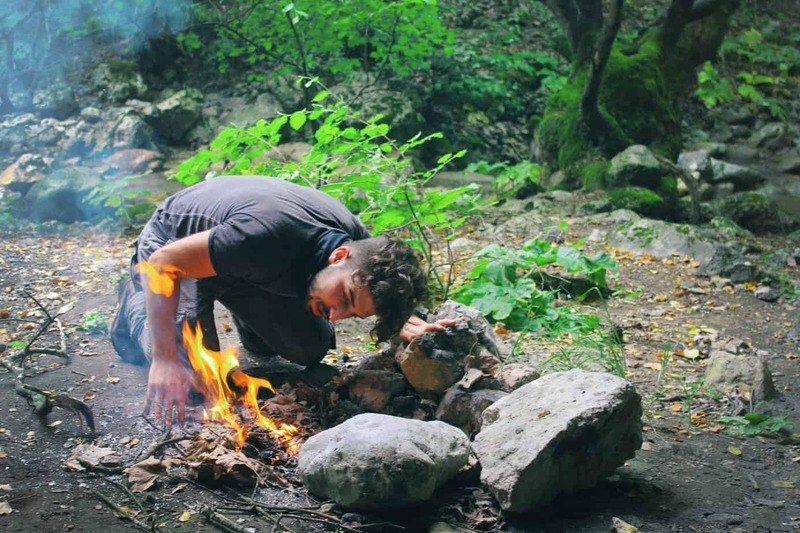 Weather problems like an unexpected rainstorm can certainly ruin a camping trip but one other aspect of mother nature is equally problematic- bugs! Mosquitoes, flies, and no-see-ums are just the tip of the iceberg when it comes to flying pests that can ruin an otherwise fun time outside. This is particularly true in the summer months in areas near water. Having a bug-proof cover to eat, talk and relax is a necessity in some areas. 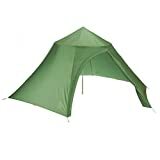 The NEMO Bugout Shelter is a great choice as a canopy designed to keep bugs at bay. Like other canopies by major outdoor brands, Nemo made the Bugout large enough to fit over standard campground tables. Where Nemo decided to go different is how the tent is set up. 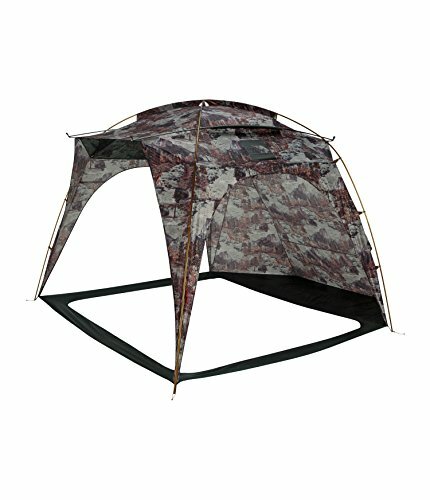 You may have noticed that the Bugout doesn’t come with poles, and this is because this shelter is sold as a tarp rather than a structure. Simply string up the Bugout between two trees or use trekking poles. You can buy full height aluminum poles separately, and this will give maximum use out of this canopy. While the lack of included poles is somewhat of a disadvantage, it’s actually quite the opposite for campers that want the versatility of a tarp rather than a tent. You can set up this shelter anywhere you’d like and in any shape configuration. There are numerous stakeout points along the panels for complete customization. 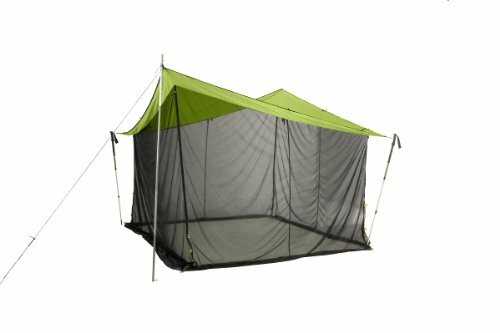 Some people even add this canopy right off of their tent as a DIY mesh vestibule/kitchen/dining room/etc. As an added bonus, the mesh walls not only keep out bugs but the fine mesh also is naturally water repellent. This means that it isn’t going to stop rain, it instead helps prevent water splash or blowback from rain and wind. When weather is clear and bugs are away, but you still want sun protection, simply roll up the mesh sides and tie back. There are really are so many ways canopies can be used. Not only are they useful as a secondary shelter for camping trips, but also as shelter during hunting trips, day visits to the beach, weekend events with family and more. The 3 canopy tents featured here are just a few examples of why skipping the cheap store-brands and investing in a quality product is the way to go to get the most bang for your buck.